This painting by Auguste-Hyacinthe Debay, dating from1838, is usually said to depict a particularly notorious episode from the Terror in Nantes, the execution on 19th December 1793 of the La Métairie (or La Métérie) sisters, the "four cousins of Charette". It is an imposing canvas, over than two metres high, and a tour de force of Romantic sensibility. The ladder to the guillotine is painted an ominous red and the bourreau and his assistants are prominent in their Phyrgian bonnets. The belfrey of the Bouffay prison is clearly visible against the clouded sky. The moment is full of pathos: the sisters huddle in despair at the foot of the guillotine; to the left the condemned mount the ladder to the scaffold. 1. 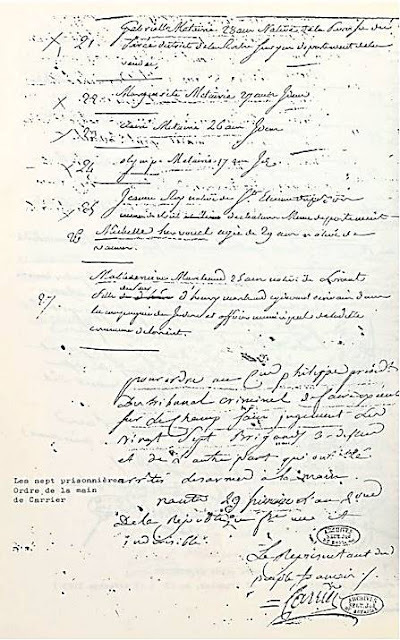 To have given, on 27 frimaire Year II, to Phelippes, president of the criminal tribunal of the department of the Loire-Inférieure, sitting at Nantes, a written order to execute, without trial and on the spot, twenty-four brigands who had just been arrested under arms, and brought to Nantes, of whom two were thirteen and two fourteen years old; to have on the same day, repeated the order verbally, although Phelippes had represented to him that it contravened laws of 19 March, 10 May and 5 July 1793. 2. To have, on 29th of the same month of frimaire, given a written order to Phelippes to have executed without trial twenty-seven brigands who had been arrested under arms, and who had also been brought to Nantes, among there number being seven women. The twenty-four prisoners executed on 27 frimaire were fishermen and peasants mostly from la Chapelle-Basse-Mer: they included four young boys: Julien Peigné and René Berthaud, aged fourteen and René Charron and Louis Guillocheau who, at thirteen years old, were legally minors. 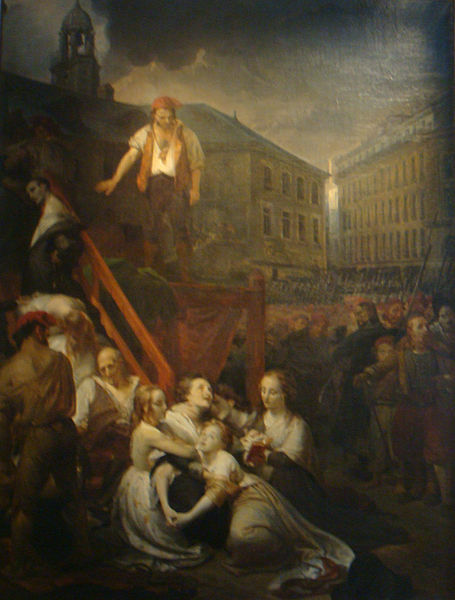 According Bernard Laquèze, the concierge at Le Bouffay, the captives were not even taken to the prison but made to stand several hours in the square until they were guillotined. Carrier himself arrived by carriage to summon the public prosecutor G and the members of the Revolutionary tribunal in order to ensure the execution took place. Crespin, of the Compagnie Marat testified that he was sent to Carrier’s house by Phelippes to intercede for the two children but was met with by the proconsul’s furious refusal (“Sacré mille Dieux ! dans quel pays suis-je ? tout comme les autres !"). Dobsent, presiding at Carrier’s trial, recalled that one of the young victims had been so naïve as to ask the executioner if he was going to hurt him. Fazed by the question, the bourreau had positioned the child wrongly and the guillotine had sliced off the top of his skull, obliging him to restart the execution. When challenged Carrier denied that he was aware of the incident. Seven female prisoners, taken on the route de Rennes, because they could not catch up with the army of the brigands, arrived here yesterday evening. Among them were four cousins of the infamous Charette; they are all former nobles, and two of these women are of a great beauty. They will be guillotined today. 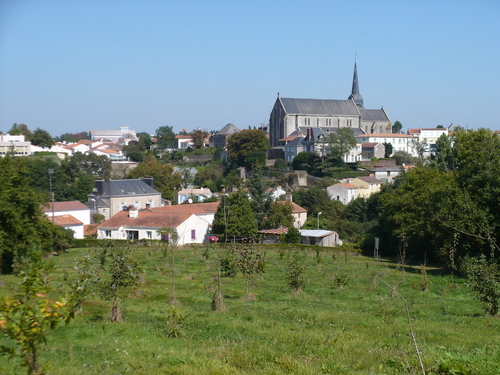 The sisters were listed as Gabrielle (aged 28); Marguerite (aged 27), Claire (aged 26) and Olympe who was only seventeen, from the parish of Poiré, Roche-sur-Yon, in the Vendée. They were accompanied by their maid Jeanne Roy, aged 22. The other two women were Michelle Hervouet, aged 29, from Vannes and Mathurine Marchand, 25, the daughter of a municipal officer from Lorient. The men picked up with them were all young farm workers from the area of Blain and Savenay. 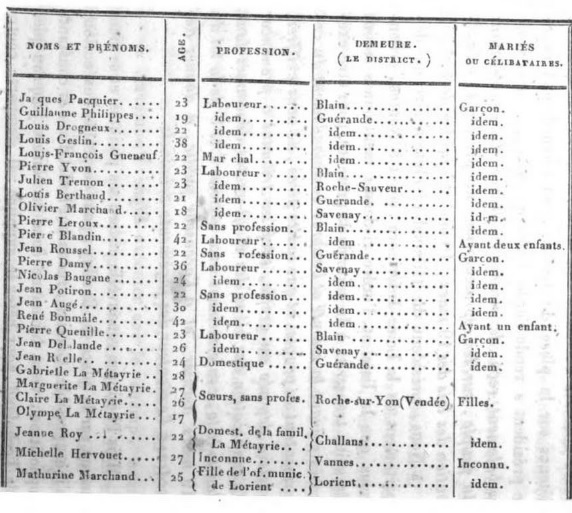 List of the twenty-seven prisoners condemned on 29 frimaire. Lescadieu & Laurant, Histoire, p.112. The women were taken first to the prison at Le Bon Pasteur, where the concierge relieved them of their diamond bracelets and shoe buckles, then at three o’clock on the afternoon of 28 frimaire they were moved to Le Bouffay to await execution. According to a servant girl at the prison, “They were crying; poor unfortunate things!”. Goudet the Public Prosecutor promised to save them but to no avail; at nine next morning they were summoned, by order of Carrier, taken out to the square and guillotined. Order for the execution, signed by Carrier. I led the demoiselles La Metayrie into a chamber and, said to them, crying, " Ah! My friends, your last hour approaches. Prepare youself for death; at nine o'clock you will be no more; it is Carrier who orders it; you will all be taken in the same carriage. The youngest, who was seventeen, gave me a ring. The unfortunate young women complained that they hadn't been given a hearing or judgment; they prostrated themselves on the ground and addressed their prayers to the Supreme Being; then they were taken to their execution, and guillotined, without judgement, as were about thirty-seven others, who awaited the fatal blade in an hour at the foot of the guillotine. The crowd was said to have given out a collective sigh, moved by the sisters’ youth, beauty and pious resignation. It was widely believed in Nantes that the executioner Michel Sénéchal was so overcome with misery and remorse that he died three days later. Phelippes confirmed that he did indeed die two or three days after the execution; according to Alfred Lallié the documentary evidence tallies: on 5th January 1794 the records show his replacement by François-Joseph Ferey, the former executioner of Pont-Audemer in the Eure. This history, which is roughly contemporary with Debay's painting, explains that the story of the La Métairie sisters was often confounded with that of Madame Le Loup de la Biliais and her two daughters who were executed on 6th March 1794. This possibly explains the presence of the older woman in the painting, which may well have been intended as a composite scene. Alfred Lallié, "Le Bouffay de Nantes", Revue de Bretagne, de Vendée & d'Anjou (1857), p.224-9. The sisters were members of the petty nobility of the Vendée, the daughters of André-Alexandre Vaz de Mello, seigneur of La Métairie or La Métérie, on the outskirts of Le Poiré-sous-la-Roche (now Le Poiré-sur-Vie). They were indeed distantly related to General Charette. Their mother, Marie-Marguerite Charette de La Verrière, who had been a widow for twelve years, died on the eve of the Revolution. The sisters had been attempting to flee to join their former schoolmistress when they were caught up in the chaos of the Virée de Galerne. The Revolution was to consume the entire family, for both brothers joined the Légion de Béon and were killed fighting for the Royalist cause: Alexandre-Désiré in April 1794 and Césaire-Victor at Quimper in June 1795. Jean-Baptiste Carrier: Portraits of a Terrorist?